On our last days we have been visiting Previ once more. 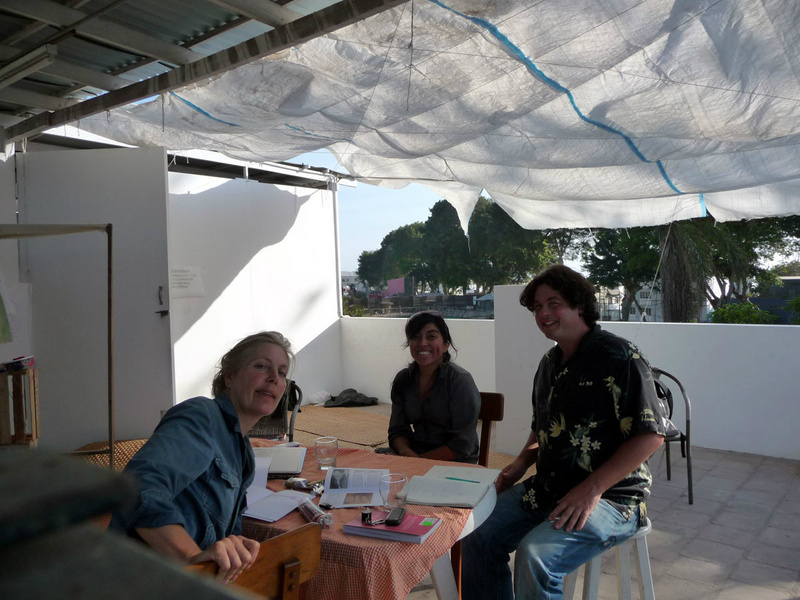 It was great because we visited this time with a comprehensive study (Time builds- about Previ) and an architect friend from Lima. It was good because it was easier to read the buildings this time and we have finally found the work of dutch architect Aldo van Eijck. 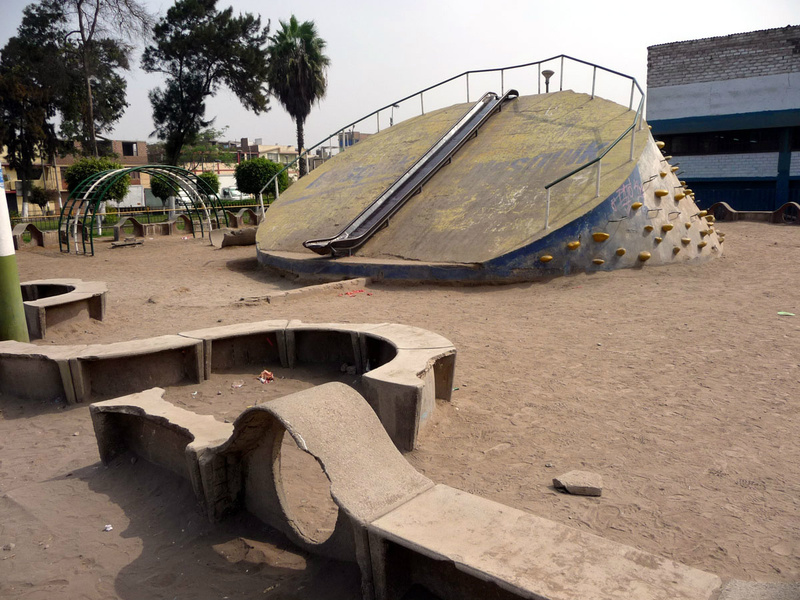 It is a beautiful but rundown playground still present today. We have to make a plan to save it, because the neigbouring school and local residents want to get rid of it, to make another soccer field. 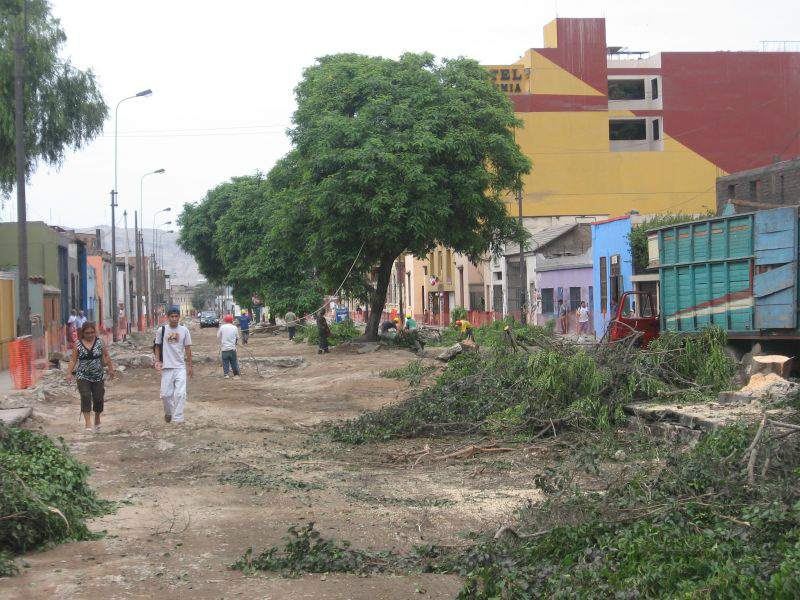 In 2009 all of the trees on the street Bolognesi in the district of Baaranca were cut without any previous information or consulting the neighbourhood. The reason was of an drastic intervention to do with the Metropolitano (a busline, the only public transport). Today this street looks like a very naked, stripped version of the original, only cars and houses. No good places to relax and hang out. Only logistics and NO public spaces. A hard way to learn about what urban green means in residential area' s. It is so much more than only a colour. A meeting with Sofia Chacaltana. She is a good scientist that studies ancient andean cultures in relation to the contemporary times. She is a archaeologist and a antropologist, a very healthy combination. With her we were talking about the public spaces that Andean communities had. What meaning and functions they could have provided, were the spaces changing according to the seasons, what were average measurements in villages and bigger settlements. One of the important things that she taught us today is, That every reality has something under the surface from the past. In the case of Lima she explained that the whole historic centre (where the central government, the parliament and cityhall is seated today) we recognize now as Colonial hertitage, is actually built upon preHispanic foundations. So it was not a new beginning, the founding of Lima in 1532. Also there was a whole system of irrigation, that today is still present in the urban plan. We have been looking at several old cityplans of Lima, trying to understand the present by looking into the past. 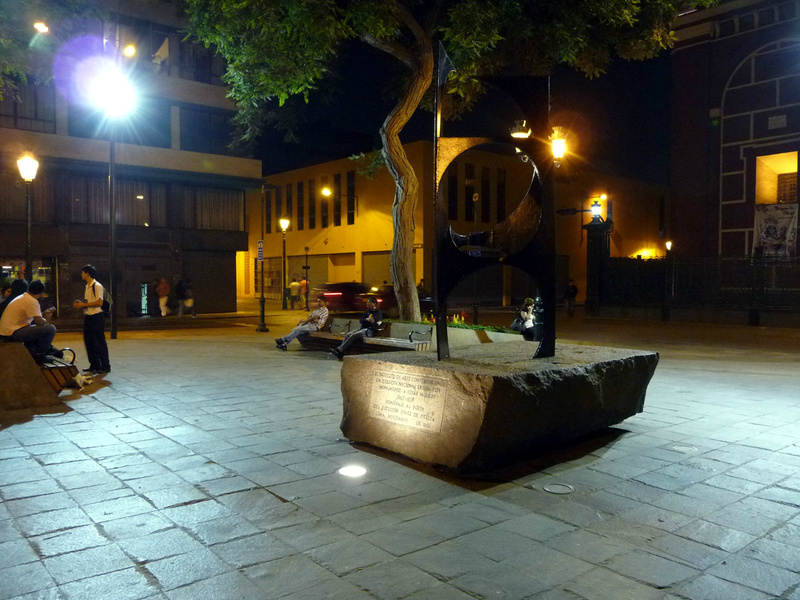 The public art piece is from 1961 and is dominating a square downtown Lima. It is there to commemorate the poet Cesar Vallejo. It is a big piece of steel, sort of left overs because circles have been cut out. it is sunk into a BIG piece of stone as a base. The stone floor is of the same material. It is of a perfect seize and feels like a living room in the city. In the evening a nearby shop funktions like a bar and the seats are taken by citizens that have a relaxed evening in a well funktioning public space. Young people, some women with a bottle of wine. and an older accountant falling asleep. Muy tranquillo....You only have to wrap your alcoholic beverage in a paperbag. In recent talks with historians, urbanistas and geospecialists we were exploring the topic of memory of place and disaster. 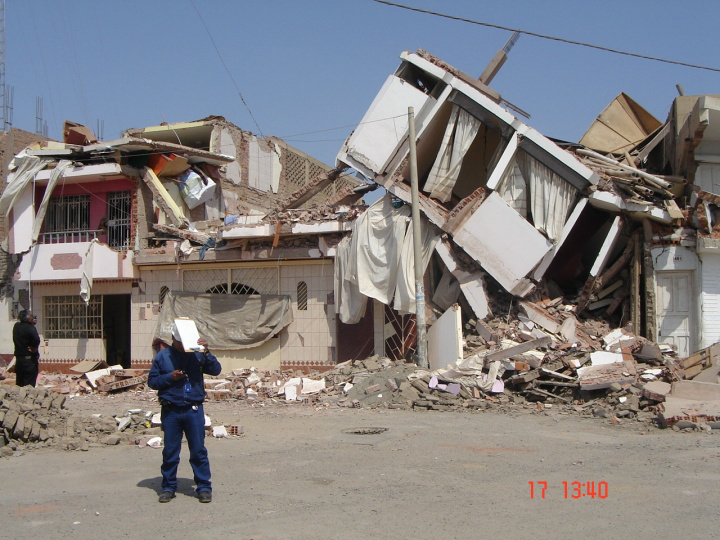 Because the 'Pueblo jovenes' or in policy language 'Asentamiento humanos' are always in areas of great disadvantages, like on steep slopes tugged away in the hills... Everthing goes well but in case of an earthquake it is another story. The sites are not fit to carry houses, they will slide of the hills in case of seismic activity. Many people will die. The constructions will NOT hold. Sustainability is a difficult term because the people seem to have the right to built their house in the wrong place before understanding the impact and implications. Who is bringing that common sense? Which political leader is up to this bad news interview? !